Autodesk University 2018 Showcases the Future of Making | Autodesk, Inc.
LAS VEGAS, Nov. 12, 2018 /PRNewswire/ -- Autodesk University — Beginning today, 10,000 architects, designers, engineers and digital artists will gather in Las Vegas for Autodesk University (AU), the annual Autodesk, Inc. (NADSAQ:ADSK) conference for those who design and make the world around us. Over four days of learning, networking and knowledge sharing, attendees will look to advance industry practice. 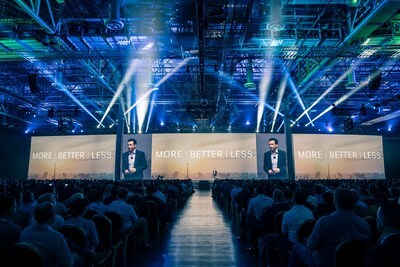 In the AU General Session, Autodesk President and CEO Andrew Anagnost will share his perspective on how automation, the convergence of design and make technologies, and the changing nature of work can unlock opportunities to do more, better, with less negative impact on the world. He will be joined by several guests, including Autodesk CTO Scott Bourdin, Autodesk Director of Robotics Erin Bradner, and author of "Imagine It Forward" and former GE Vice Chair, Beth Comstock. "With increasing population and urbanization and the continued rise of the global middle class, the demand for more is inevitable. To meet the rising demand with the world's finite resources, we must combine automation and human imagination to design and make in new ways," said Anagnost. Two additional industry keynotes for the architecture, engineering and construction (AEC) and manufacturing industries, along with TED-style sessions in the AU Theater, will bring together Autodesk and industry experts to take a deeper look at how the convergence of design and make, the blurring of industries, and new automation technologies are creating new opportunities. Real-world examples of customers who have already taken advantage of these opportunities will be found in the AU Expo. Examples include a robot-equipped shipping container that can be brought on-site to additively manufacture custom construction components on-demand; a materially efficient flooring system that makes construction with concrete more sustainable; and a Formula One car reimagined with generative design and visualized in virtual reality. Over the course of the event, Autodesk will also share new product advances, partnerships and initiatives that will help its customers prepare for the future of making. Posts to Autodesk's company blog, ADSK News, will reveal more information as news is announced. For the fourth consecutive year, AU Las Vegas will be carbon neutral. This year it is being achieved through a collaboration with ClimateCare and Burn Cookstoves, maker of the fuel-efficient Jikokoa cookstove. To date, Autodesk has supported Burn Cookstoves to avoid 40,000 metric tons of CO2. Burn Cookstoves is part of the Acumen Fund, an Autodesk Foundation customer that supports sustainability solutions to address global poverty. UNHCR, the UN refugee agency, has been selected as the recipient of the 2018 AU Las Vegas Donation Drive. UNHCR is a global organization dedicated to saving lives and building a better future for the 35 million refugees around the world fleeing conflict, persecution, and natural disasters. Autodesk software is helping UNHCR's refugee settlement site planners shelter migrants in more efficient and effective ways. This year's flagship Autodesk University event in Las Vegas is supported by diamond sponsor HP. Autodesk University (AU) is a series of conferences and an online learning destination focused on inspiring, challenging and energizing Autodesk software users, partners, and industry leaders about the future of design and engineering. The AU conferences bring together more than 22,000 participants at live events in 10 countries through classes, forums and keynotes with industry experts and thought leaders. More than 2.5 million more engage through AU Online, which offers free year-round access to learning content, professional development, and inspirational industry talks from the AU conference events. More information is available at the Autodesk University website, or by following @AutodeskU, #AU2018. Autodesk makes software for people who make things. If you've ever driven a high-performance car, admired a towering skyscraper, used a smartphone, or watched a great film, chances are you've experienced what millions of Autodesk customers are doing with our software. Autodesk gives you the power to make anything. For more information visit autodesk.com or follow @autodesk. Autodesk is a registered trademark of Autodesk, Inc., and/or its subsidiaries and/or affiliates in the USA and/or other countries. All other brand names, product names or trademarks belong to their respective holders. Autodesk reserves the right to alter product and service offerings, and specifications and pricing at any time without notice, and is not responsible for typographical or graphical errors that may appear in this document.